In the last Souring Methods blog post, we described kettle souring. This post will outline an alternative method to quickly produce sour beers through short-term mixed fermentation. If you stopped by 42 North Brewing this summer, it’s likely that you have seen some variation on our farmhouse sour series. This project started last fall with small-scale experiments, and has now been brewed several times on our 20 BBL system. Like a kettle sour, this beer is fermented with both Saccharomyces (brewer’s yeast) and Lactobacillus. 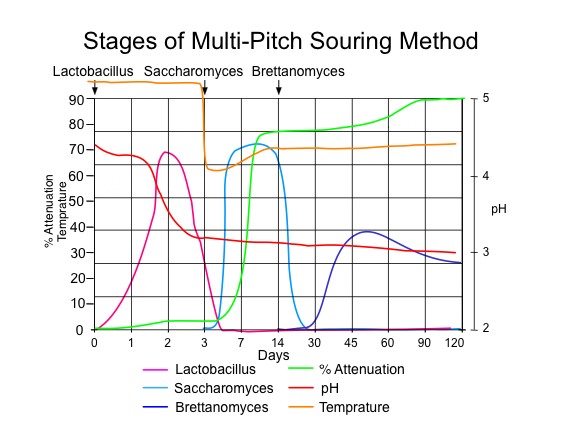 However, instead of pitching the Lactobacillus first, souring the wort, and then killing it off with a boil, we pitch the Lactobacillus into the fermenter with the yeast and it remains alive throughout the entire process.